We are engaged in offering Ice Tong to our patrons. It is used to put ice cubes into different beverages. The offered product is examined on several parameters by our quality auditors to ensure defect free product at the patron's end. Size: 8" onwards to 24"
The innovative design of this tongs ensures comfortable grip and interlocking feature guarntees complete safety. These scissor shaped Tongs are highly durable, strong and have a beautiful brushed stainless steel finish. In line with client's diverse needs, we bring forth a distinguished collection of SS Kitchen Pincer. 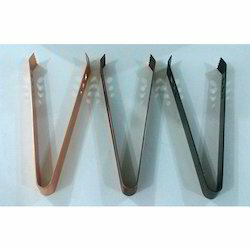 We are one of the prominent manufacturer and supplier of Teeth Tongs. 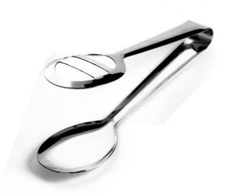 Our clients can avail from us a wide collection of best quality Serving Tongs.These products are made from high quality components.